Area 51 is now so ingrained into popular culture that it’s virtually synonymous with Aliens; it’s impossible to mention one without the other somehow creeping into the conversation, but why are the two so intrinsically linked? Why do we automatically picture little green men any time someone so much as mentions the words, Area 51? First it’s important to realize what Area 51 actually is. For all intents and purposes and according to every government document ever released, Area 51 is a “secret” military base where they test experimental pieces of military hardware. For example, experimental jets such as the SR-71 Blackbird and the Lockheed U-2 Dragon Lady were tested at the Area 51 base. The latter of which was actually the first piece of hardware publicly known to have been constructed and tested there. The site Area 51 was built on was supposedly first chosen due to the incredibly smooth land found on nearby lake beds, coupled with the area’s natural inaccessibility. Both of these features made it perfect for testing aircraft like the Lockheed U-2 which required a large area of flat land from which it could take off and land, while at the same time required being in an area enemies of the US couldn’t, at the time, easily lay their peepers on. Understandably for a location that deals in incredibly sensitive military information that costs billions to produce, the government has a real hard on for keeping it secret. However, over the years, this hasn’t exactly panned out. For example, on April 19th, 1974, Astronauts taking part in a Skylab mission accidentally photographed “the airfield at Groom Lake“- Groom Lake being an alternative name for Area 51. The funny part being that this photo wasn’t taken by the ship the Astronauts were on, it was taken by one of the Astronauts when he pointed his camera out of the window. This is despite the fact that said astronaut was under specific instructions not to take pictures of that particular area of Earth; it’s not currently known whether or not this event was a mistake made by the astronaut or a conscious decision on his behalf. The first known picture of the site to eak its way into the public domain was taken in 1968 during a U.S. Geological Survey, however, as far back as 1955 papers have made passing reference to the facility, referring to it as a “super-secret atomic energy commission installation“- they obviously sucked at naming things back then. Though the government has always maintained a rather tightlipped stance on the base, slip ups have been made in the past. For example, in this PDF, Area 51 is referred to, by name, by the, then CIA director Richard Helms in a secret memo discussing air reconnaissance of North Vietnam in 1967. However, for the most part the government has always either remained coy or simply ignored the site altogether when referring to it in official documentation. 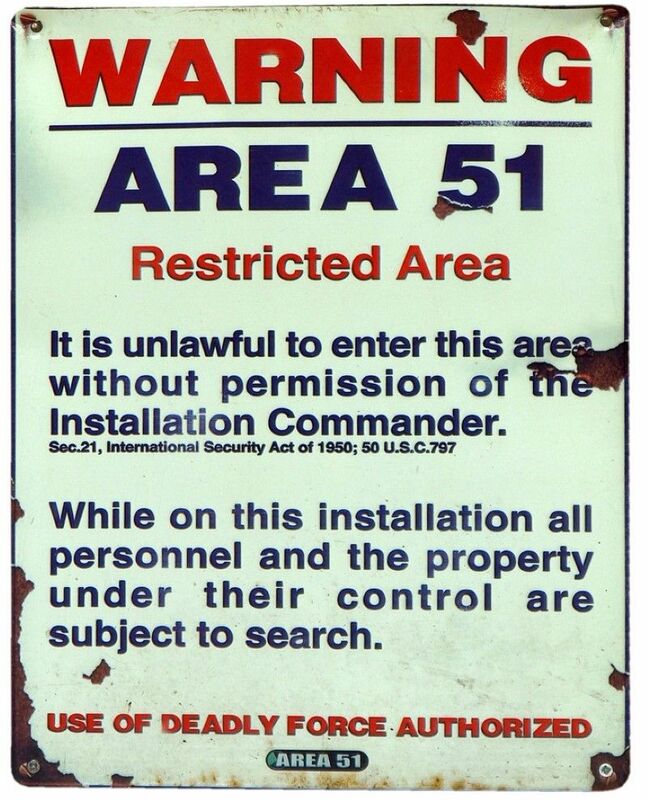 As for what it’s like to work at Area 51, unlike pop-culture would have you believe, the people who worked there aren’t forbidden from ever speaking to their family or held in giant underground bunkers a-la Independence Day. Just ask James Noce, who worked in the secret facility for decades; though James has been sworn to secrecy, as is to be expected when you work on highly experimental classified government projects, he’s free to talk about his experiences there. For example, James noted that he was always paid in cash, whereas others were paid in cheques from companies they didn’t work for. Even more interesting, when a plane from Area 51 crashed once, James was tasked with confiscating the cameras of a nearby family, who were quickly rewarded with a fat stack of cash for their silence. So why do we think aliens are stored there? Although the testimonials of people like James, trusted government and military officials with decades of experience, do include a number of telling facts about Area 51, he and the other people who’ve spoken out about it have never once alluded to any sort of alien activity ever occurring there. But of course, the government would say that; governments lie all the time about stuff like this. So what about Roswell? Surely that’s when all the rumors started, right? Well, not so much. Though today some conspiracy theorists believe that the craft that crashed at Roswell was of Alien origin and that it was or is now being stored in Area 51, when the incident first took place, area 51 wasn’t mentioned in any documentation from that time. Not to mention the fact that the two sites are hundreds of miles apart. If the wreckage was of alien origin and it was moved, it’s likely the government would have moved it somewhere closer. Though the Roswell Daily Record from July 6th, 1947 did feature the words “Flying Saucer” on its front page, secret government facilities, and in particular Area 51, were not mentioned. As noted above, it would be another 20 years before Area 51 was even referred to in an official sense; people back then had no idea it even existed, meaning that they’d have been unable to suggest that the wreckage could have been taken there, even if they did believe it was of extraterrestrial origin. In fact, it would appear that the stories about aliens being held in Area 51 are a rather recent invention. It wasn’t until 1989 when the awesomely named Robert Lazar appeared on a Las Vegas TV Station under the guise of a government scientist and stated that Area 51 was just full of alien technology, that interest in Area 51 and aliens really started to gain momentum. We should mention that almost as soon as Lazar appeared on TV, every single one of his credentials was pulled to pieces- no school he claimed to attend had ever heard of him and the science behind his theories was soundly debunked. However, the very first known mention of Area 51 on TV was a full year earlier in 1988 during the show “UFO Cover-Up? : Live!“, which oddly enough revolved around the possibility of the existence of UFOs being covered up. Just to clarify, Roswell, UFOs, Aliens, little green men and Area 51 were in no way linked, as far as popular public opinion was concerned, until exactly one man went on TV and claimed that that was the case. Science!